Provide comfort for the family of David Rea with a meaningful gesture of sympathy. David P. Rea, 68, life resident of Mattydale, died Monday, March 18. Dave was a graduate of North Syracuse High class of 1968 and attended O.C.C. He served in the US Marine Corps during the Vietnam War. Dave retired in 2012 as a dock manager from the Scotsman Press. 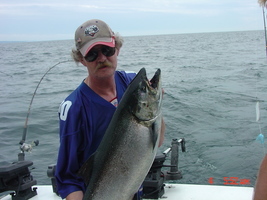 He was man avid sports fan who loved the Yankee’s, the Giants and the Syracuse Crunch. Dave enjoyed fishing especially up in the Adirondacks. Dave was predeceased by his parents, the late James and Gertrude (Funcke) Rea. He is survived by his brother and sister-in-law, Michael and Lisa Rea, and by his niece and nephew, Jamie and Michael Rea, all of Mattydale. To send flowers in memory of David P. Rea, please visit our Heartfelt Sympathies Store. Provide comfort for the family of David P. Rea by sending flowers. My brother, my friend, my companion through life, a huge part of my life, a hole that can never be filled, I miss him very much.